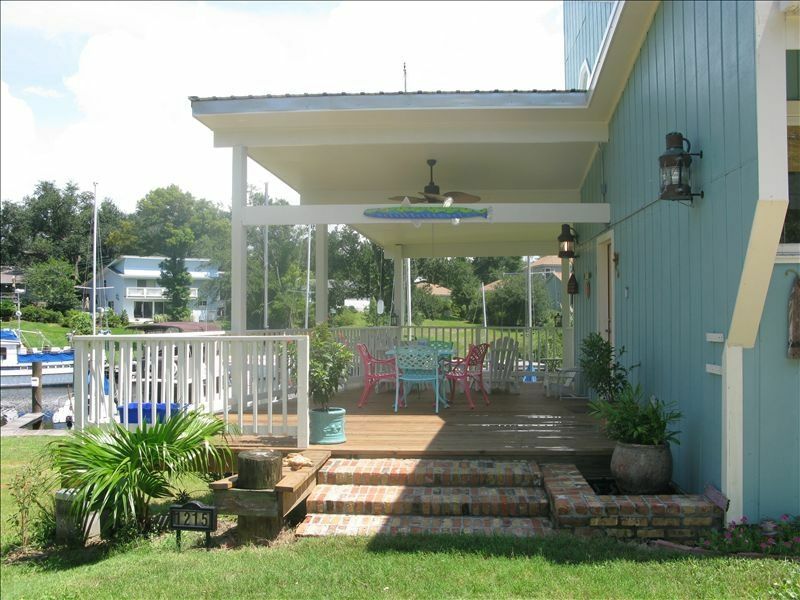 This unique cottage is located directly on the beautiful Ocean Springs Harbor. Its large deck is a wonderful place to relax, and observe the sailboats and wildlife. Pelicans, Great Blue Herons, Night Herons , Egrets and Skimmers all frequent the harbor on a regular basis. You can easily walk to the beach or downtown Ocean Springs, which is filled with art galleries, boutiques and over 100 restaurants. The casinos are just 10 minutes across the Biloxi Bay. Charter boats are available for hire in the Ocean Springs Harbor and Biloxi Harbor. Several golf courses are within a short drive, as well as kayak rentals and tennis courts. The Master bedroom is located upstairs in a loft, with the bathroom downstairs. The large living room has a queen size sofa sleeper. There is a kitchenette with a dining area. Bicycles are available with the cottage to cruise the shaded streets of this historic town up close. Our beaches are still uncrowded and our waters provide some of the best seafood in the country. Something wonderful is always in season: crabs, crawfish, oysters and always fish of all kinds. In season, you can even walk to the the harbor and buy fresh shrimp right off the boats. Our Harbor House is filled with local art and whimsy. It was once part of the original Ocean Springs Yacht Club which was destroyed by Hurricane Katrina. Thankfully, the Guest House survived and has been completely remodeled with love since the hurricane. Jack & Beth Riley lived on this property until Hurricane Katrina rudely moved them out in 2005. However, they couldn't give up on this wonderful location and still retain the Harbor House for themselves, family, friends and visitors. The Riley's own a photography studio in downtown Ocean Springs. This was once our home. We moved to Ocean Springs because of its small town charm and historic beauty. Watching the boats and birds in the harbor from the deck; walking to the beach, buying fresh shrimp from a boat in the harbor or going to one of the many shops, galleries or restaurants in town. High quality bed linens and plenty of towels are furnished. Kitchenette with small appliances including: electric skillet, electric burners, slow cooker, electric tea kettle, coffee pot, toaster oven, and coffee pot. Charcoal grill outside. Yes! It is the Coolest Cottage in Ocean Springs! We had the most relaxing weekend in a long time. Even with threat of bad weather( happened while sleeping ) The cottage was where we wanted to be! Beth gave great recommendations of restaurants and a seafood store, that we picked up fish to grill outside and have dinner on the beautiful deck! We will be back! Thank you, Beth and Jack! Loved the cottage. Very comfortable & wonderfully decorated. Walking distance to the beach & close to downtown. Quiet setting at the harbor with a porch to relax & enjoy the view of the boats. Plenty of walking paths along the beach, over the bridge, & through town. My husband and I had a blast celebrating our Anniversary in Ocean Springs! The cottage on the harbor was delightful and only a short walking distance to the ocean. We enjoyed fishing from the dock and exploring the shops in the downtown area. We explored Gulf Islands National Seashore, beautiful hiking trails. Only a short drive to Biloxi. The only con to staying in this cottage is, as previously mentioned, the amount of light that comes through the bedroom windows at night which makes it difficult to get a good nights sleep. The Harbor House is a cozy, comfortable cottage. Great view and great location being close to the gulf and downtown. Very nicely furnished as a beach cottage with great prints and artwork. Also, we brought our dog and there were great areas by the cottage to walk her in some nice neighborhoods or walk to the beach. We will stay here again on future trips. I'm so glad you enjoyed it. Look forward to seeing you again. We enjoyed our stay at this quaint cottage. Very relaxing being able to sit on the deck, by the water, watching the boats and the pelicans! Enjoyed morning and evening walks along the docks and the beach. Location is great, few blocks to the historic shopping area. Would definitely stay again if we are in the area!